Considering that our hockey games on Friday night seem to all start after 10:00pm, it really has put a cramp into my late night eats. In pure desperation, we now look to Downtown for our dining options. Hey, it's looking pretty grim for other parts of Vancouver, where the only thing open is either a 7-11 or an "accupressure" place... So when I bounced the idea of trying out the new 100 Days in the Opus Hotel to Lionel Hutz, he seemed to be interested. Milhouse and Silent Bob came along for the ride and really didn't have a say. It's too bad that we were a little under dressed for Yaletown. Ladies in high heels with their male counterparts in slick duds, we were not fitting the mold in our runners, jeans and baseball caps. No matter, we couldn't get into 100 Day anyways since it shares a line with the Opus Bar. 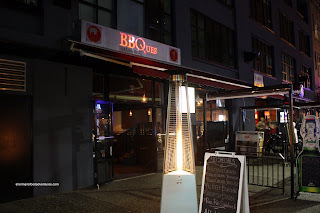 We then decided to take a stroll in Yaletown to find some late night eats. With nearly every idea striking out, we settled on heading over to Section 3. But just before we made it there, we ended up walking into BBQues instead. Nothing like BBQ just before bedtime! 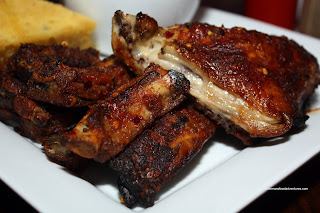 On that note, I decided to go for the Chicken & Rib combo with cornbread and mac 'n cheese. For what seemed like an eternity, the food finally came out. 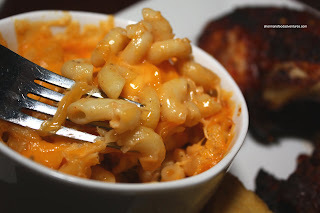 Appearance-wise, everything looked the part - from the charred meat to the cheesy macaroni. However, the ribs turned out to be quite dry with some inedible parts. This can be attributed to being BBQ'd in individual pieces rather than a whole rack. I asked for spicy and indeed it did have a kick; yet the BBQ sauce was mostly one note and did not have any complexity or smokiness. I did like the chicken though, it was tender. The Mac 'n Cheese was a mitigated disaster. It's as if they merely tossed cooked macaron i in shredded cheddar. It turned out to be greasy with no real flavour. The Cornbread was not very good either. It crumbled on contact; hence being dry. Moreover, it was sweet enough to be considered dessert. Milhouse and Silent Bob both had the BBQues Burger. Well, not much to say about this other than it was your typical burger. Nothing inherently wrong with it and nothing special about it either. It did the job. Lionel Hutz ended up with the BBQ Rib Sandwich. Very similar to a pulled pork sandwich (just with different meat), it was decent. The best part of the dish was the accompanying salad. Looked good and was very fresh. Alright, I know we shouldn't be expecting much since it was very late and this is Yaletown. I wanted to like it, I really did. BBQ is one of my favourite types of food and when it isn't done right, it's truly disappointing. I have to admit the pricing at BBQues is very reasonable considering the location and the raw materials. Even better using the Let's Go For Dinner card (which I didn't preload...). 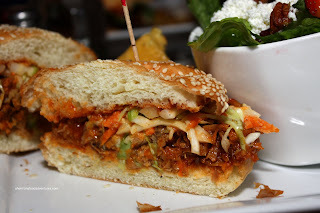 But the bottom line here is that one can get much better BBQ, such as Memphis Blues. 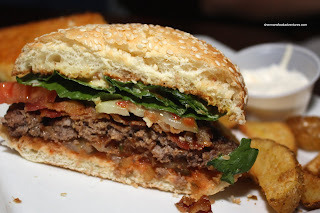 You know who has a decent burger, yaletown brew, recently redone menu and the 'backyard' burger is one of the best, tastiest burgers.